“The American Soldier”: That is the title of a traveling photographic exhibition that has been on the road since 2007, capturing unusual scenes from nine wars, since the Civil War – one of the first armed conflicts to be widely photographed – to the streets of Baghdad, in 116 images. Cyma Rubin, the creator of the exhibit, says that she first thought about the project in 1995 while seeing a picture taken of an American soldier during World War II and wondered: “He looks like he’s thinking, ‘Why should I be here?’”. From an initial selection of 4,000 pictures she came up with the hundred-and-something: “This exhibit touches a patriotic nerve – capturing the joy, the sadness and, sometimes, even death – that’s at the core of soldiering. It’s very emotional.” Furthermore, she adds that the exhibit is totally apolitical and that those looking for an anti-war statement, or one that glorifies conflict, will be sorely disappointed. The exhibit still is – undeniably – a tribute to American soldiers, and one is uncertain whether it humanizes or romanticizes the drama of war. In the introduction to Annie Leibowitz’s 1999 book of photographs, “Women”, Susan Sontag writes: “It’s for us to decide what to make of these pictures. After all, a photograph is not an opinion. Or is it?” The bombardment of war images taking place daily makes it seem unlikely that an image suffices to make an opinion, at least an informed one. The case of books – particularly those dealing with the selfsame dramas of war – is very different and it would be difficult to pin down a book without an opinion. In the genre of war writing – ranging from chronicles, to diaries, memoirs, history books, journalists’ accounts and novels – that inundate the bookshelves of Middle Eastern contemporary history, we find the most diverse range of opinions about war and the many wars that have plagued the region; what is rare however is to hear a story told by the “Other”, that is, an American soldier deployed in Iraq, and rarer even how difficult it is to think of his book as having an “opinion”. Vince Perritano’s novel “After We’re Free” (2008, third edition 2011, Wheatmark) comes to fill this gap with an uncanny sense of impaired judgment about the overtly complex and multi-layered story that he is telling, while at the same time he offers us a glimpse into the opinions that the experience of war imprinted on his fictive characters. But what he is offering in this curious novel isn’t simply the literary geography of what an author might think, imagine or research that the experience of war is like. We also learn that the novel was written during the author’s second tour in Iraq in 2007. Whatever there is of truth in the novel – as distinguished from simply fiction – is something that we will never know. The crucial point for Freud is that both biography and autobiography essentially lie and Sarah Kofman, a contemporary French philosopher and one of the 20th century’s most able readers of Freud, insists that any auto-biography is false and written with a retroactive illusion and with the purpose of idealization. While Kofman pointed at the fallacy, she also recognized that autobiography leaks itself into any literary and intellectual endeavor, and paradoxically, after writing her own autobiography, she took her own life in 1994. But Isak Dinesen’s famous saying, “All sorrows can be borne if you can put them into a story or tell a story about them” serves here the purpose of showing how novels – and literature in general – perform a task nobler than that of chronicling events in which one was himself a participant, and that are probably already diluted and watered down infinitely by personal subjective experience. A case in point here would be the enormous corpus of auto-biographical literature on the Lebanese Civil War or the Israeli occupation of Palestine. 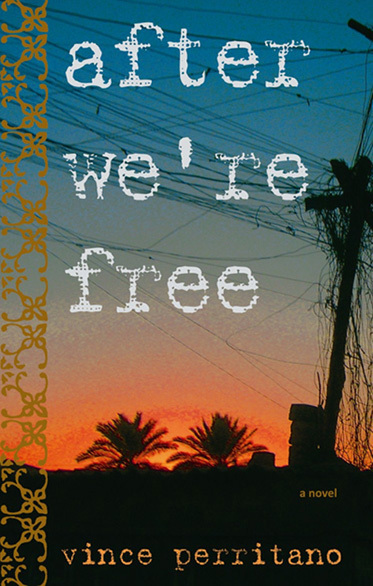 “After We’re Free” is a polyphonic novel, ineludibly American, set simultaneously in Ramadi and different American cities, written in a discontinuous present that defies the narrative ego – for the story is told in the first person – and in itself proves how unreliable a device the memory is for storing events chronologically; preferring to speak in terms of colors and tones, grasping or at least attempting to grasp the ever changing particulars of existence, that are never bound by any such a thing as a fundamental essence. The late Tim Hetherington, both and expert and casualty of war, told Tyler Malone in an interview shortly before his death: “The war-machine is: take a group of young men, train them together and put them on the side of a mountain, and they’re gonna kill and be killed for each other. It’s something very human.” This is precisely the story that “After We’re Free” is telling.